13 bedrooms – 10 doubles, one single and one two-bedded suite. Total of 7 bathrooms: 4 x ensuite and 3 shared or 3 ensuite and 4 luxury twins/family rooms. St Catherine's Court is located 4 miles from Bath in England. St Catherine’s Court is a luxury private residence located in the town of Bath in England which can be hired for exclusive use only. Located on the western slopes of St. Catherine's Valley, 4 miles from the Georgian city of Bath, it was once the seat of the abbots of Bath. The church of St. Catherine, still operating as the parish church, is set within the Court and there is also a 15th century tithe barn. St. Catherine's Court, a Grade 1 listed monument, is a fine example of a late Tudor and early Jacobean Court built in Renaissance style, with Benedictine origins dating back to 950 AD. The earliest recorded history of St. Catherine's Court is found in a Court Roll dating from 1310. 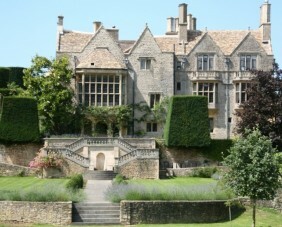 Built of Cotswold stone under a stone-tiled roof with stone mullion and leaded light windows The Court retains original fires and features which date back to the reign of Henry VIII and beyond. Three years ago St Catherine’s court underwent an extensive restoration and now can claim to be one of the most beautiful properties in the world. The house has under-floor heating, beautiful log fires, large and comfortable beds and bathrooms in rare natural stone – offering a unique standard in luxury. The property sits on 15 acres of outstanding manicured gardens and rolling hills. There are also organic vegetable gardens and orchards which supply the kitchen with fresh produce daily. Nestled on the grounds is also a tennis court for guests use. The rental price includes a resident Chef for the service of Full English Breakfast, Canapés, 3-course dinner*, followed by Coffee and Petits Fours. * Dinner can be exchanged for a 3-course lunch/full Afternoon Tea. Tea/Coffee and soft drinks together with home-baked biscuits will be available throughout. A large variety of Champagne and wines can be purchased from our wine list. Staff for the service of drinks prior to dinner and for food and wine at dinner. Activities available for the guests include tennis, treatments, painting, croquet, use of the Piano, well stocked Library, woodland walks, cookery demonstrations, board and video games and cards. Other activities which can be arranged include, horse riding, hot air ballooning, clay Pigeon shooting, cycling, golf, archery, tours and theatre, fishing, shooting and canoeing.